The London Book Fair is an exciting time of year: for three days thousands of people gather to share their passion for the book industry. As you walk amongst the towering stands and pops of colour it seems impossible that just a few days the halls of Olympia were bare and empty waiting for yet another exhibition. So, what actually happens in the lead up to the London Book Fair? What is it like to be an independent publisher preparing for the events in the industry? Our preparations for the London Book Fair 2019 began as soon as the last one ended. Our first step was to secure our stand for another year. The stand itself is a marketing tool. It’s an opportunity to raise awareness for our upcoming titles and our brand. Our production and marketing team started working on designs for the stand panels in Winter 2018. We designed an eye-catching stand that featured our titles for 2019. Creating promotional materials followed in early 2019 – catalogues, bookmarks, posters, tote bags and pens to give out to our stand visitors. It was also crucial to ensure we had enough proof copies of our books for rights meetings, bookseller visits and general display. Our stand was also laid out to accommodate rights meetings. 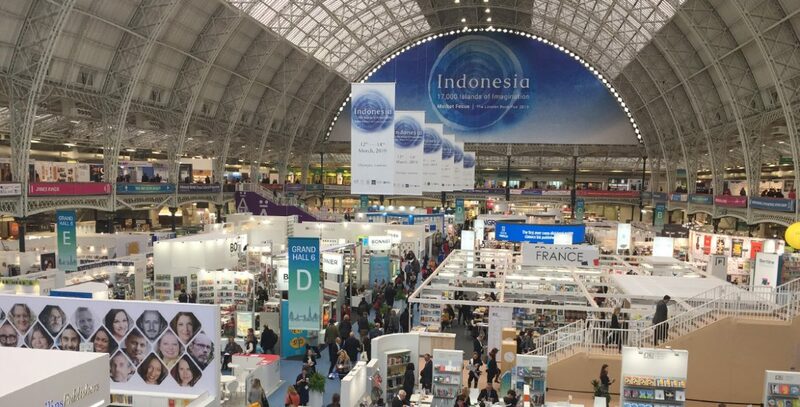 With so many industry professionals in one place the London Book Fair is a key opportunity to meet with agents and discuss rights. A lot of buying and selling of rights takes place at the fair or soon after. Because of this it is very important for us to reach out to contacts well in advance of the fair, ideally two months before. That way we can book our meetings with those who are already interested in our lists. However, if it is the first contact we’ve had with any foreign sub-agents and publishers, some initial email and phone exchange may take place even further in advance, sometimes even four months before the fair. The rights department did a lot of research on potential connections in the lead up to the London Book Fair. There’s a lot of different publishers and agents who all focus on different titles or areas. We had to make sure that we were meeting with the correct people for our books and available rights. Once our meeting schedule was set, there was still a lot to prepare beforehand. We had to make sure our rights lists were up-to-date and printed along with any advance information sheets and other relevant material. We also had to make sure some of the ordered proof copies were set aside for presentation at these meetings. The last aspect to prepare for the fair was drop by visits. The London Book Fair is also a great place to meet new contacts. We loved having interested people come up and ask about our books. A month before the fair we reached out to booksellers and invited them to come and see physical copies of our upcoming titles. Our books are all beautifully designed and we really enjoyed being able to show booksellers how our titles look on the shelf. Meeting booksellers at the fair also gave us the chance to learn more about their preferences and what kind of promotional material and events they might be interested in. The fair also provides a great opportunity to meet new artists. We have connected with many fantastic book designers and illustrators this year and we’re really looking forward to collaborating with them in the near future. We also had a lot of interested writers come and learn about our open submissions policy and our novella collection, the Fairlight Moderns. It is no longer just exhibitors and service providers who participate in this trade show. Over the years the London Book Fair has adapted its program to draw in more members of the public. This year we had an amazing time meeting plenty of people from different parts of the industry but also general readers who were simply interested in our books. We can’t wait for next year, we’ve already started planning.